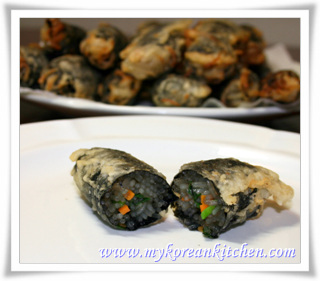 Learn how to make a popular Korean street food – deep fried seaweed spring rolls! 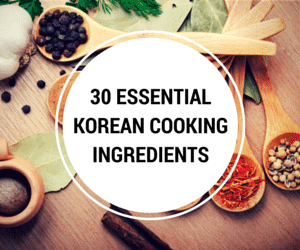 They are a perfect companion to Korean spicy rice cakes (Tteokbokki)! Deep fried seaweed spring rolls are essentially a simple version of Japchae (Korean glass noodles) stuffed in a seaweed sheet. 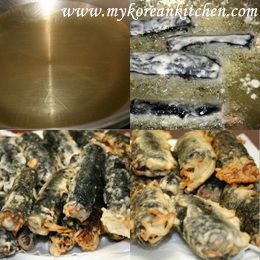 Once the seaweed sheet is rolled up, it is coated with frying batter then deep fried. So if you happened to have some Japchae left over, this dish is a great way to use it up! 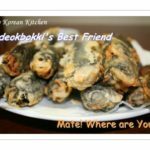 If you go to a Tteokbokki (떡볶이, Korean spicy rice cakes) special shop or mini vans or carts that sell Tteokbokki, you can see these deep fried seaweed spring rolls there most of the time. You can have these rolls as they are or ask the shop owner to mix with Tteokbokki. I always prefer the later option. 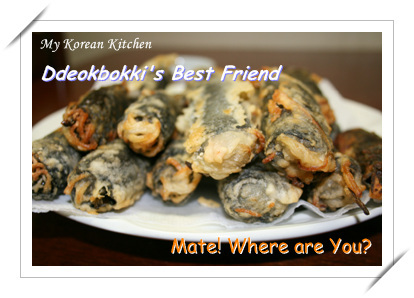 Deep fried seaweed spring rolls in Tteokbokki sauce? Oh~ Yum!! It is so delicious. They are crunchy outside and chewy bouncy inside. In fact, I like these rolls more than Tteokbokki. That means a lot, don’t you think?! 🙂 You must try this soon! Enjoy! 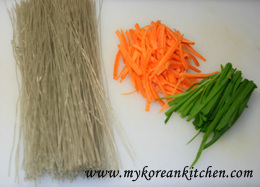 1.Put the noodles, carrots and garlic chives into a mixing bowl. Add the sauce and mix it well with your hands. 2. 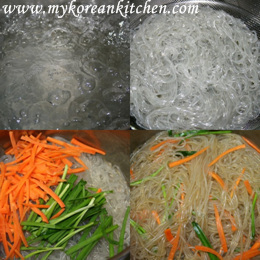 Place a small amount of glass noodle and vegetable mixture (from step 1) onto a seaweed sheet. Roll the seaweed up. (If you brush some water on the edge of the seaweed after rolling it, it will stick better.) Repeat this step for the remaining ingredients. 4. Pour some oil into a wok. Once it starts to boil, add the battered seaweed rolls. Fry them until fully cooked (about 2 to 3 mins). Take them out and put them onto a kitchen paper towel to soak off any excess oil. 5. For extra crispiness, fry the seaweed rolls once more. Put the noodles, carrots and garlic chives into a mixing bowl. Add the sauce and mix it well with your hands. 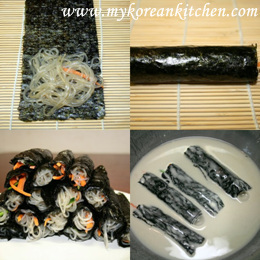 Place a small amount of glass noodle and vegetable mixture (from step 1) onto a seaweed sheet. Roll the seaweed up. (If you brush some water on the edge of the seaweed after rolling it, it will stick better.) Repeat this step for the remaining ingredients. Pour some oil into a wok. Once it starts to boil, add the battered seaweed rolls. Fry them until fully cooked (about 2 to 3 mins). Take them out and put them onto a kitchen paper towel to soak off any excess oil. For extra crispiness, fry the seaweed rolls once more. WOW! This recipe looks amazing!!! I’ve never come across any meat or fish in these rolls when I had them at a restaurant or at a street vendor. I think you should be able to. (I’ve never done it myself.) Assuming you will be freezing it after deep frying? I am forever grateful for your healthier version! I recently came across these as they were giving samples at a local Asian market and I instantly became addicted. I literally have to eat at least four of these every day. I was wondering if I can make them the way you suggested with the rice paper and freeze them so I can take a couple at a time? i love your website, but can u make a video? u know, Vietnamese hard to understand English, but i can, so it’s ok to read! haha 😀 thanks u!! Wow Cannot believe I finally found a recipe for Gimmari. 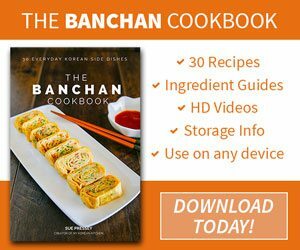 I have been looking for this recipe for a long time. 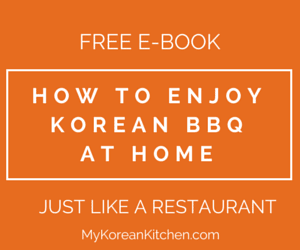 i want to try to cook korean food, and i think this one is easy to make. since i dont hav a laver, is it okey if i use nori instead of laver? anyway, whats the difference between the two? heheheh… sorry, its my first time. Nori/Laver/Dried seaweed is essentially the same thing. Nori is Japanese term. oh my gosh!!! I LOVE gimmari! I’m so glad you put up your recipe for them! I can’t wait to start making them. I love your website, btw, keep up the great work! I used potato starch powder. Enjoy! i wanted to know what kind of starch powder you used for this? thanks so much!! your site is the greatest!! I guess it can be a bit messy, though if you don’t cut it, the inside parts (noodles) won’t get seasoned with the ddeokbokki sauce. That is why I recommend to add it just before you serve the meal. And stirring them lightly, a couple of times, can be helpful too. i was wondering, if u cut the ginmari into half before mixing it with ddeokbogi, will the filling(especially the noodles) fall out and won’t it be very messy then? oh, by the way, i love your blog ^ ^….i loooove korean food!! thanks for your reply!! Does Gimmari mix with stir fry ddeokbokki with gochujang sauce or royal rice cake ( gungjung ddeokbokki in korean)? When you mix Gimmari with ddeokbokki, you don’t need to add any extra sauce. You will share the ddeokbokki sauce with the Gimmari. Cut the Gimmari in half with scissors, then add it into the ddeokbokki cooking wok (just before you serve the ddeokbokki that is). Then stir it well a couple of times (for about 1 minute) with the ddeokbokki. so how do you mix Gimmari with ddeokbokki? Do you stir fry and what kind of sauce you need? Thanks a lot! !